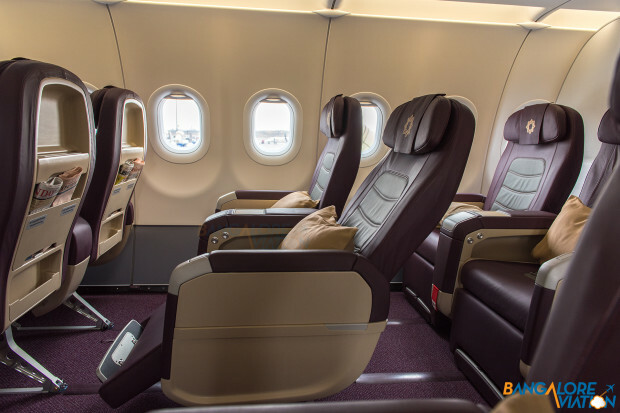 Vistara A320 Business class, seat recline profile. BangaloreAviation photo. 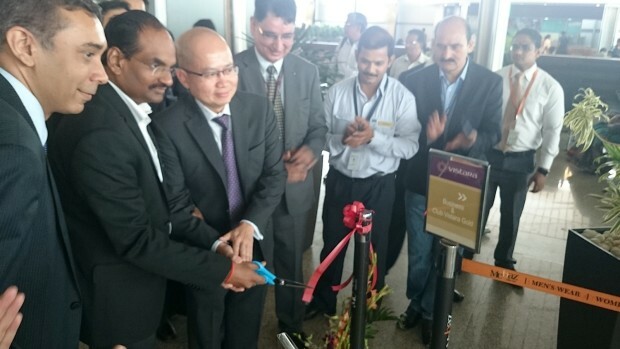 Bangalore Aviation had covered the launch of the Tata-Singapore Airlines joint venture, Vistara, on January 9, 2015. We reviewed the premium economy class at that time. I was looking for an opportunity to experience Vistara’s business class and it came on March 1, 2015. I was invited by Vistara to experience the airline during its inaugural flight from Hyderabad to its New Delhi hub. I was specifically requested to compare my past experiences on Singapore Airlines (SQ) which I flew very regularly with the service offering of Vistara. I used to be a Solitaire PPS Club member, the highest level of elite membership, of Singapore Airlines, earned after five continuous years of business and first class travel qualification. Being spoilt by years of SQ pampering, I hold inflight service to a much higher standard than most passengers. We reached the terminal about 07:30 and we greeting by the usual morning rush. Entering the terminal, there were no information screens showing the location of Vistara’s check-in counters. After a little bit of looking and walking around we spotted the inauguration paraphernalia and soon were in front of the counters, which were decked up in the same manner as those during their inaugural flight on January 9th. Soon after the lamp lighting by officials of Vistara and GHIAL the airport operating company, we proceed to check-in. 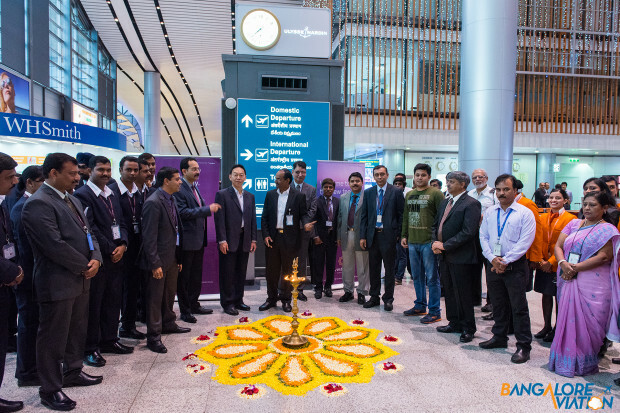 Vistara Hyderabad New Delhi inaugural flight. Lamp lighting ceremony with dignitaries. 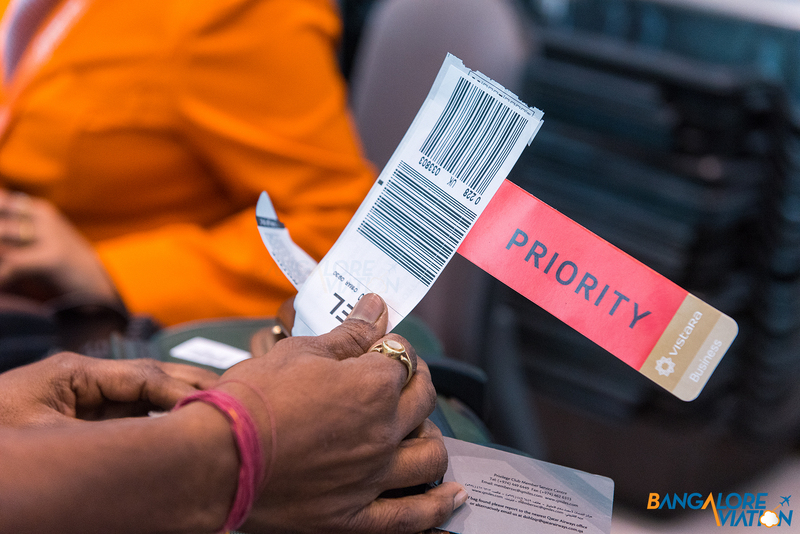 There are three check-in zones, one for each class, Business, Premium Economy and Economy, the last having multiple counters. Ground handling is outsourced to Air India-SATS. (SATS was formerly Singapore Airport Terminal Services). Vistara RGIA Hyderabad premium check-in counters. The check-in was quick and efficient. I was third in line and yet took less than five minutes to reach the counter. 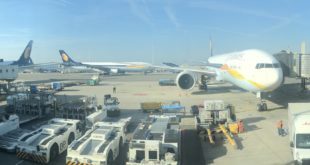 A quick smile, welcome to Vistara, usual pleasantries, and my bag was quickly weighed, checked, and marked with the business class priority tag. We were escorted by Vistara’s chief commercial officer (CCO) Mr. G.M. Toh, and the CEO of GHIAL Mr. SGK Kishore, and senior officers of both the airline and the airport. Toh previously served as the India head of Singapore Airlines before moving to Vistara. Our exclusive interview with him reveals some deep insights in to the ASEAN carrier’s strategy. Vistara leaders G.M. Toh and Rashmi Soni with SGK Kishore, CEO, and other airport officials. 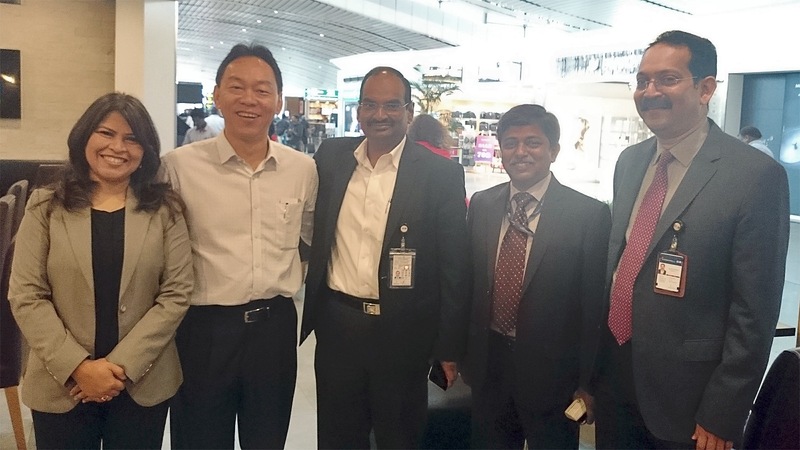 Vistara’s CEO Phee Teik Yeoh came in on the in-bound ferry flight from New Delhi and was soon involved in the inauguration festivities with Kishore. Phee-Teik was the station manager of Singapore Airlines in Los Angeles, at that time the largest station of Singapore Airlines in the United States. We used to meet frequently since Los Angeles was my regular entry-exit point. We were soon reminiscing about the inaugural Los Angeles Singapore non-stop flight SQ19 on February 3, 2004, the longest non-stop flight in the world at that time, which I had the privilege of flying. The flight took 18.5 hours and was operated by the Airbus A340-500 which the airline called LeaderShip. The six flight crew wore electrodes to measure brain activity through the flight to enable the airline to plan rest periods for the future. The flight was a pioneer and there was precious little data available. But back to the present. Vistara and GHIAL CEOs Yeoh and Kishore inaugurate the Hyderabad to New Delhi flight. The departure of the flight was called, and we commenced our boarding. The airport gave each passenger a box of fruit biscuits from the city’s iconic Karachi Bakery. We were welcomed on board and escorted to our seats by one of the cabin crew. A great practice pioneered by Singapore Airlines, now followed by most airlines. 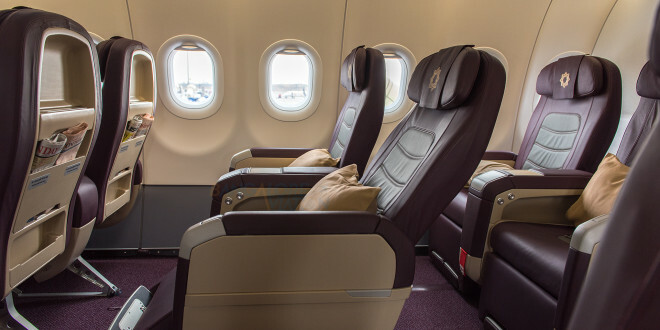 Vistara’s business class is 16 seats in four rows in a 2-2 configuration with a 42 inch seat pitch and a width of 20.12 inches. The seat back recline is seven inches while the leg rest angle is 60 degrees. Vistara A320 Business Class cabin. Vedant Agarwal. A quick comparison of the seat recline. Though it does not appear much, it is good considering the intra-India flights which will be a maximum of three hours. Seat comfort is good. 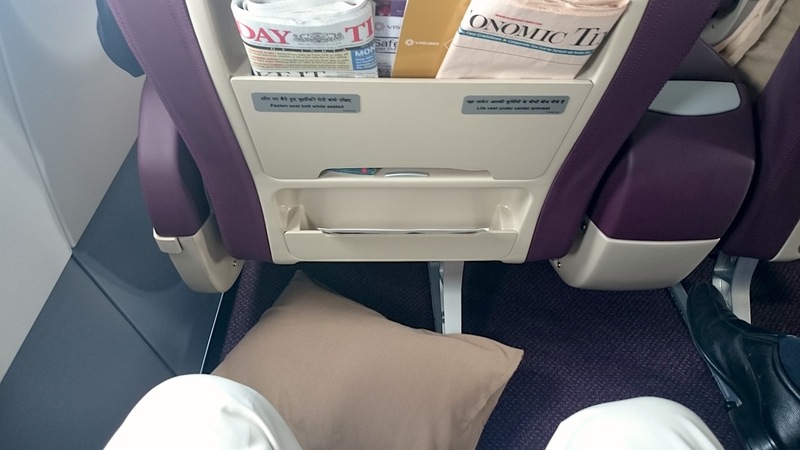 Vistara A320 Business class seat compare recline and upright profile. BangaloreAviation photo. 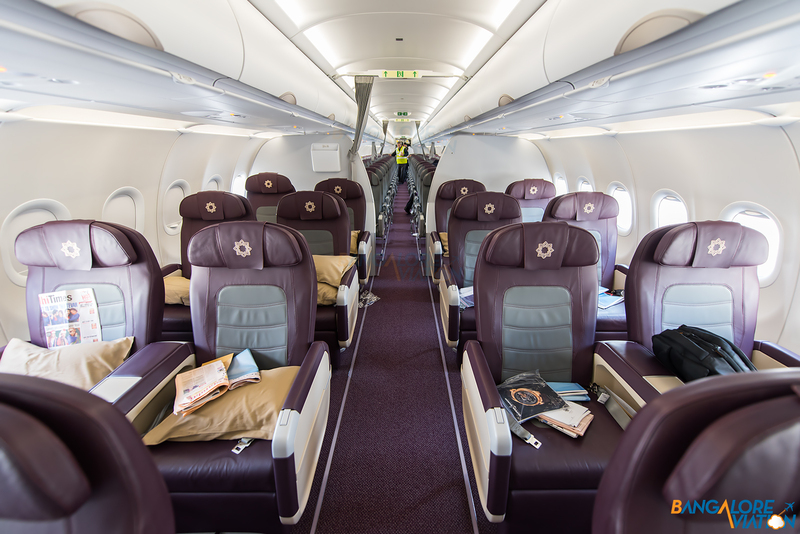 The premium economy and economy class cabins. Interestingly, Vistara uses all leather head covers for a better feel and richer look in their cabins. 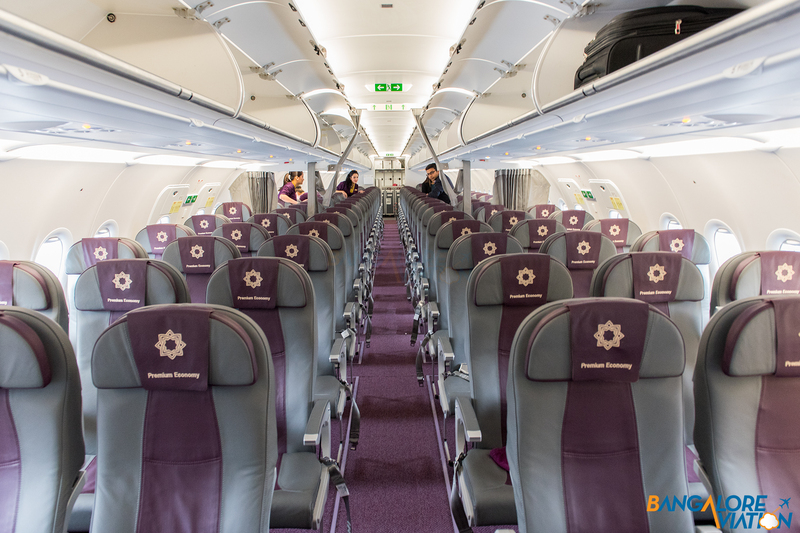 Vistara A320 Premium Economy and Economy class cabin. 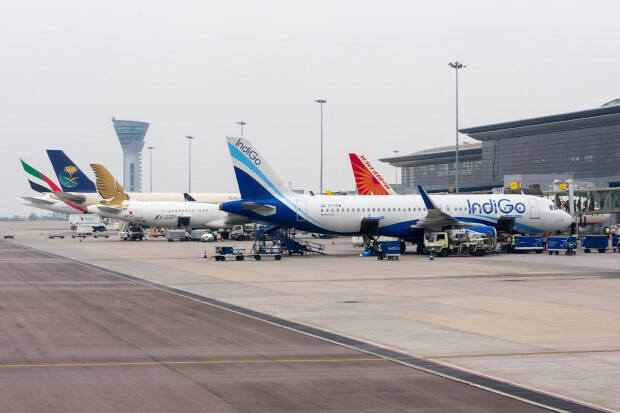 BangaloreAviation photo. The business class seat is filled with newspapers for the corporate traveller. As expected the leg room is generous. Vistara A320 business class seat. Leg room and news papers. Vistara has a clever extension on its business class table which gives stability when the table is pushed forward to accommodate ‘large sized’ passengers (like me). However the lack of a drinks glass shelf at the front of the armrest should be corrected by Vistara. Both my neighbour, the President of the Travel Agent’s Association, and me, both frequent fliers, almost knocked over our drinks which were placed in the centre armrest and frequently obstructed our arm movements. 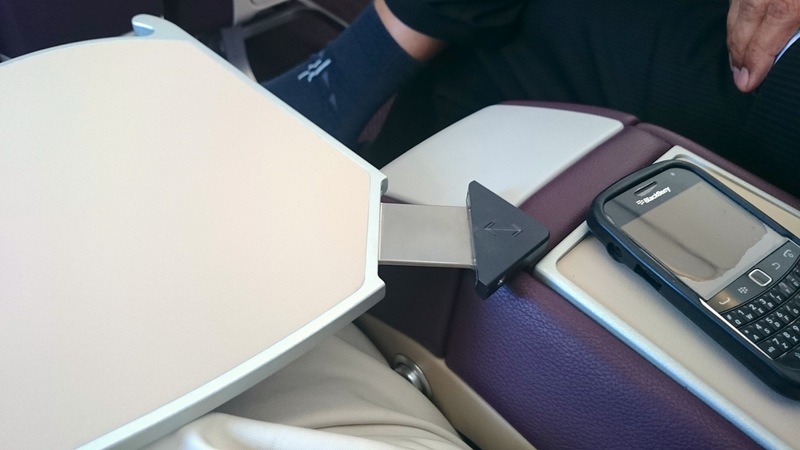 Vistara business class table extension gives stability. The lack of a drinks glass shelf needs correction. Soon after we sat down we were offered a choice of drinks. The uniform of Vistara is in this rich royal purple colour with the Vistara star logo in tone-on-tone. Vistara cabin crew uniform; carrying signature mocktail. Boarding complete we were soon pushing back on the way to New Delhi. The ramp at Hyderabad is dominated by the middle east carriers. The ramp at Rajiv Gandhi airport, Hyderabad. The breakfast is broken in to two courses. The cereal and fruit course, followed by the main course. The catering was done by the award winning TajSATS flight kitchen. Another Tata-Singapore joint-venture, now headed by Grand Master Chef Satish Arora, formerly the Group Executive Chef of the Taj Group of Hotels. 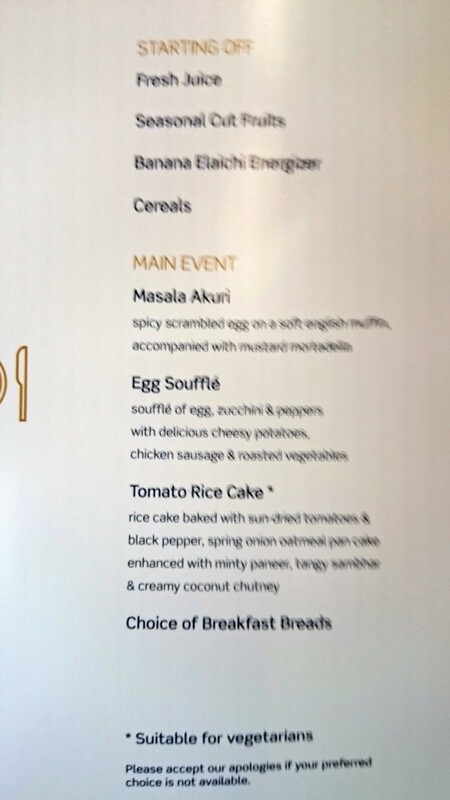 Vistara business class breakfast menu, main course. 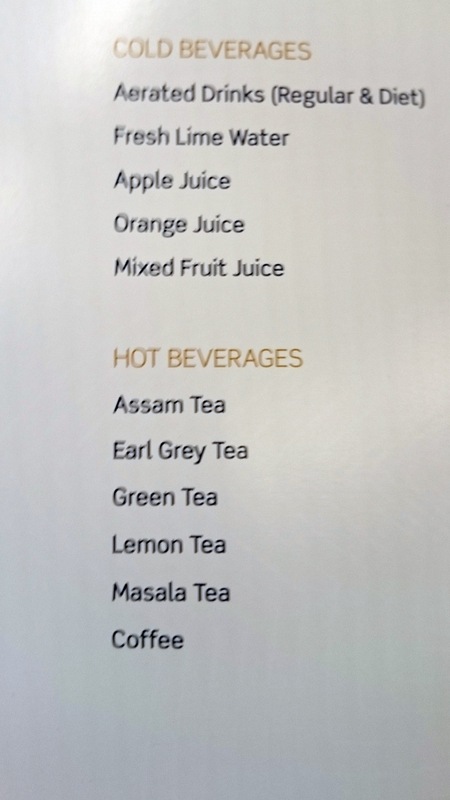 Vistara business class beverages and drinks menu. Just prior to the breakfast service we were presented with hot towels, and my hat is doffed to Vistara. They have these super-thick towels which retain the heat forever, unfurl and place on your face for a mini-spa experience. Even Singapore Airlines’ towels are not as thick and luxurious. Good job Vistara. Breakfast commenced with fresh juices, fruits, breads and cereals. High quality jams from Germany. 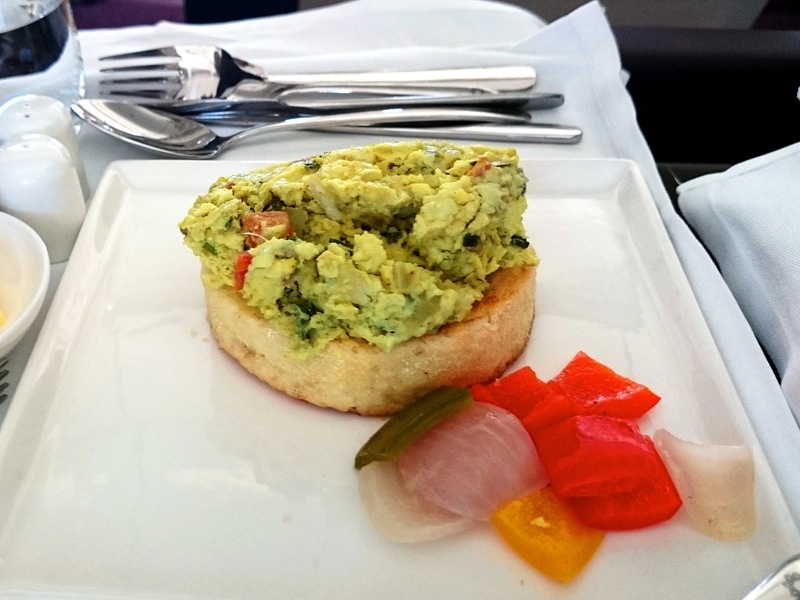 Vistara business class breakfast. Cereal and fruit. I chose the eggs soufflé while my neighbour chose the eggs Akuri scramble, a Parsi speciality, but being an eggitarian, he asked for the mortadella to be removed. 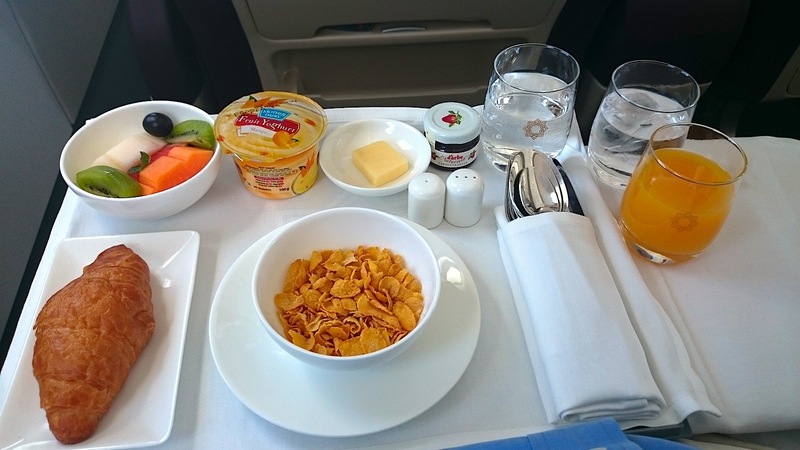 Vistara business class breakfast. Egg soufflé with sausages. 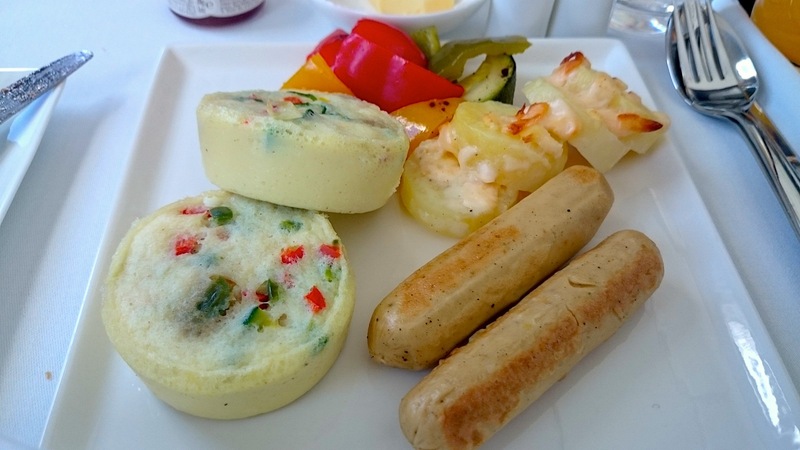 Vistara business class breakfast. Egg Akuri. It could be due to the food being uplifted from New Delhi, but the eggs were quite rubbery. It is something Chef Arora is going to have to work on. After breakfast, it was a smooth flight in spring skies and I sipped on some delicate and aromatic green tea. Through out the flight, the service was impeccable. It was attentive, smooth and refined. It would behove the premium class crew of Jet and Air India to learn from the Vistara crew (on our flight, ex Jet and ex Kingfisher), do not duck and remain hidden behind curtains. The Vistara crew were available through out the two hour flight. If one was busy in the galley the other monitored the cabin. 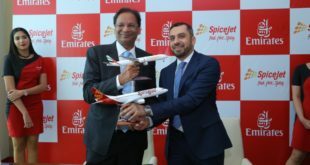 One had to just look-up and may be the discreetest of hand raises, and she was promptly by your side, “how can I help you Mr. Agarwal?” (yes that great SQ tradition of addressing passengers by their names). Vistara has followed Singapore Airlines in training their cabin crew to walk softly. It is a skill specially imparted by the island nation’s carrier to prevent passengers being disturbed by those jarring bumps hitting our spine as the crew walk by in the aisles. 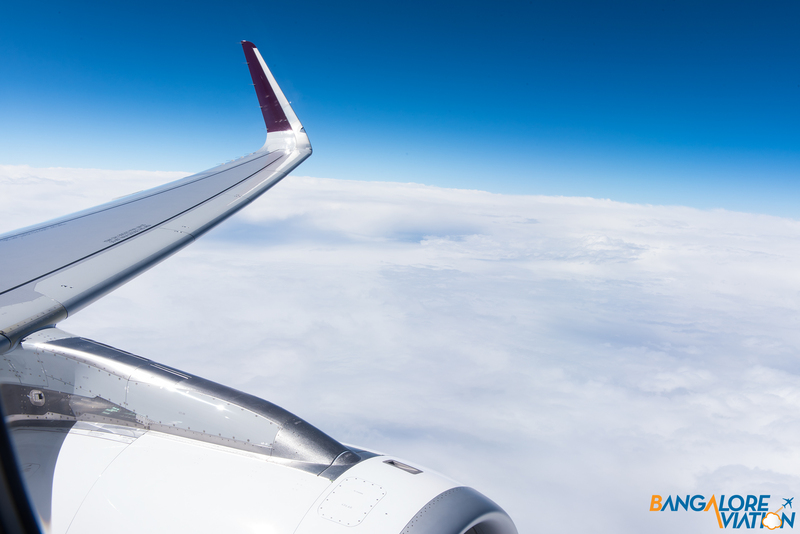 Keep a feel-out the next time you travel by your favourite airline and if you get a chance compare it to Vistara or Singapore Airlines. The video below shows a couple of trainee stewardesses at Singapore Airlines’ training centre demonstrating the soft walk. You will hear minimal sounds despite the ladies wearing heels. We have highlighted the lack of an inflight entertainment (IFE) system being a shortcoming, and Vistara is addressing it. CEO Yeoh confirmed Vistara’s plans to offer streaming content to portable electronic devices. He did not explicitly confirm, but it appears Vistara will allow content to be streamed to personal electronic devices (PEDs) of passengers in the economy classes. There was rough weather during our descent in to New Delhi, and the turbulence was significant. The arrival was as smooth as the boarding, and the gate was connected quickly. One crew member blocked the business class curtain allowing speedy disembarkation, though I stayed behind to take a few more photos. To my regret the Captain of the flight refused to let us take a picture of the cockpit. Everyone’s loss. The luggage was waiting on the carousel when we walked up, and we headed out of the terminal quickly. Be it the world of fine dining, exclusive hospitality, or premium travel, there is a fine balance to offering top notch intuitive and attentive service without being intrusive or overt. Only the very best achieve this. In the aviation world, I can think of Singapore Airlines and Virgin Atlantic, and now I can definitely recommend Vistara. 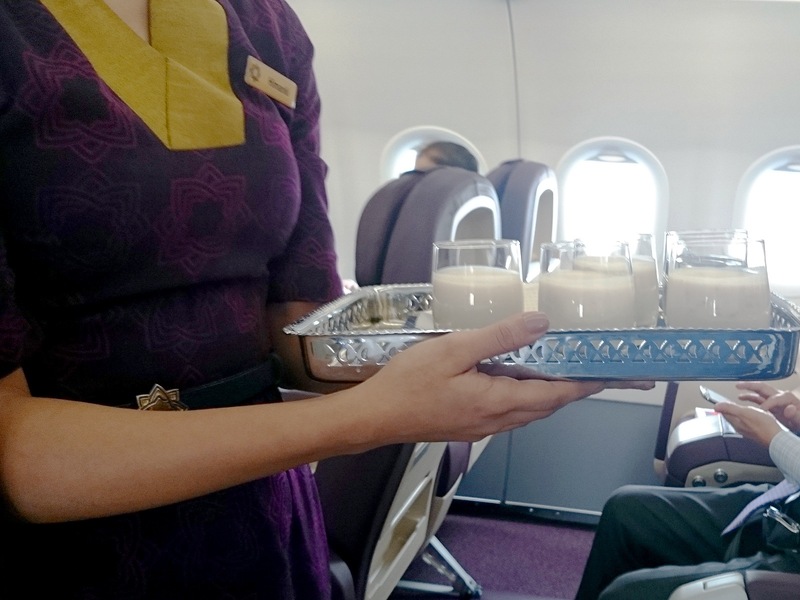 As both Mr Toh and Mr Yeoh explained, Vistara is committed to offering a very different experience in India, very personalised, very discreet, very intuitive, very attentive. 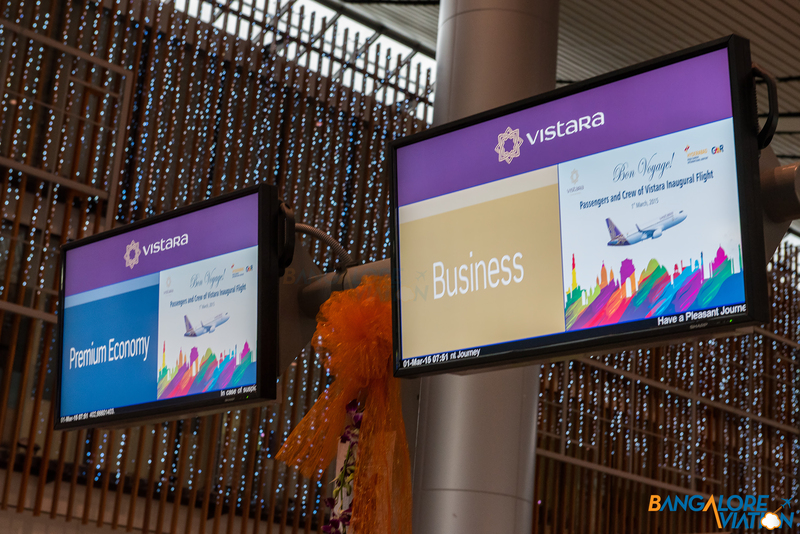 Vistara has taken the best DNA of its parents, the organisational excellence of the Tatas, the exemplary service levels of Singapore Airlines, and extended it. 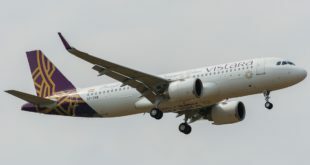 In his interaction with the media, Phee-Teik Yeoh made a telling statement “We want to make Vistara the best in the world, even better than Singapore Airlines”. In my humble opinion, they are on course.